The figure on the left is one I painted in 1993 or before, when I was about 15 years old. The model on the right is one I purchased on the very day that Warhammer 40k 2nd Ed was released. He was stripped of his Ultramarine colours and started in Dec 2008, when I returned to the gaming hobby after 14-odd years away. My marines got put aside in favour of Eldar for a long time, but with the new Badab War books, he is almost finished now. I'm quite busy with my work (Head of Year at a difficult Inner City London Comprehensive), plus I play American Football nine months of the year. I also play online Blood Bowl and like to spend my Friday nights in a drunken stupor as often as possible, so I don't get as much painted as a would like to. However, I am lucky that I find painting quite relaxing, so it is something I can do as a way to wind down with TV or a movie in the background. I started in the hobby with Blood Bowl in 1988. By the time I got into W40k, The Badab War had entered into the pages of WD, and I read about it in some back issues I picked up. It has always been my favourite bit of W40K fluff. I liked the idea of a purely political bit of infighting, and think that in some ways it is a shame The Red Corsairs were developed. When I got back into the hobby, I started painting up a few Lamenters, along with a few Mentor Legion guys. In 1994 I pretty much stopped playing GW games, and by 1996 I was out of RPGs and M:TG too. I drifted back into RPGs by playing Neverwinter Nights whilst living in Japan, which in turn led to playing WAR a bit more recently. That led not into WFB, but into W40K, and I dug stuff out of my parents loft and started buying again in late 2008. I started off with Orks, flirted with Marines, then went back into a huge Eldar fixation with occasional forays into painting marines. Since the Badab War books from Alan Bligh came out, I've been back on a huge Lugft Huron trip. I have about seven to eight thousand points of marines, I expect. I originally planned that they would all be Lamenters, but since the books came out I realised I also wanted a Tyrant's Legion force, which could double as an Astral Claws army. Then I thought "Why not have some Executioners too?" and I've recently decided to do a small (1000 points-ish) army using Azhara Redth and Gitsplittas scheme. It'll probably be just Tac squads, a counts-as-Kantor and some Sternguard. That will give me elements of all five parts of the Secessionist forces in the Badab War. Anyway, allow me to show you some of the models I have produced so far, and then I will give a breakdown of my project list. I like the way ArbitorIan does his army blogs, so I will include that here too. Captain Pearce is my first ever Lamenter. I painted him when 15, so I think he is decent, for that. I'll not repaint him, anyway, as he has historical signifIcance to me. I doubt I'll use him all that often, but he is available if I need him. I probably will rebase him, as he won't match the rest of the army otherwise. I have no idea how he was painted, as it was 17 years ago! That is more than half of my life so far! I know I chickened out on the checkers, and at the time I do remember he represented a huge technical achievement for me. These two combat squads are the basis of my first 500 point block. They were painted before the Blood Angels Codex came out, or I'd probably have gone straight for Assault Squads, but I do feel there is a place for Tac Squads in Blood Angel armies. They are painted with Iyanden Darksun, a Gryphonne Sepia wash, and two different yellows to highlight. The shoulder checkers are my first significant amount of small checkering, and I think with the experience I've gained here, I have a good idea of how to approach it in future. I think they look pretty good, though there are one or two little things to tidy up. To do the hearts, I did a bit of measuring of angles of the icon in the Forge World book and found it is actually quite simple. A square stood on its corner to make a diamond. A blood drop from the left corner. Semi-circles on the top edges, plus a slight bulge. The bottom top extended to make an 80 degree angle instead of 90. I was delighted with how well I did 9 of the 10 hearts. If I get around to it, I plan to put up a tutorial on how I painted the shoudler pads. The bases are home-made. I bought a LOT of the cross-hatched walkway styrene(?) sheets from the 4d modelshop in Aldgate, along with a compass that has a small blade instead of a pencil to cut out the circles to stick onto regular bases. Basecoat black. Put some Bestial Brown on a piece of tissue. Dunk the base face down onto it to pick up a smear of brown. Once that dries, use a piece of tissue to add more brown in patches, then the same using Blazing Orange. Final, a Mithril Silver highlight, and black edges. Apart from that, the main thing left to do is get the guns painted black and highlighted. I used a white undercoat, and I plan to start from black covered by Iyanden, or white with a black wash over that in future. A successful learning experience, and one I'll be happy to put on a tabletop. The last job will be numbers on the shoulder pads, which I will probably just do faintly using Devlan Mud, to try and replicate the look in the Badab War book. The Little Rhino Who Could was started at pretty much the same time as the Tac Squad above. It looks a lot darker in that photo than in real life. The checkering there is slightly bigger, and it was good practice before starting the smaller versions on the shoulder pads. The name came from the first Platinum Devil tournament in Canterbury when RinkyDink's entire army fired at it one turn, about 12-15 heavy weapons, and only the final Las-cannon left to fire in his entire army managed to immobilise it. By then it had delivered its demi-squad to where they needed to be. It also fairly heroically had success with some ramming in an earlier game. Obviously, metallics need finishing, and probably some labelling. Demi-squad DeVore still need their bases edged in black, sticking to their bases and highlighting done. If using Devlan Mud works on the Tac Squads shoulder labelling, they will get the same. I wish I had used a black undercoat on these guys, but it is too late now. The painting is a mixture of bestial brown, snakebite leather, iyanden dark sun, all with a devlan miracle wash. I like the fact they look quite yellow, but also could conceivably blend into some cover. I've decided that checkers are associated with various levels of being a full battle-brother, veteran, etc, so only the Sarge has any checkers. I'll be painting five more the same way but with bolt pistols to complete the squad, plus a sixth as a Heavy Bolter option and a fifth with a bolter. This Space Hulk Terminator was undercoated white, then given a black wash. Several thin layers of Sunburst Yellow(? - the lighter of GW's two yellows, anyway) were then painted on to get to where it is. He comes out a different shade of yellow to the Tac Squad, but I don't mind that. Infact, I made a decision very early on that I wanted my Lamenters to have a clean, but fairly rag-tag look. I got this fella as part of a job lot from EBay. I plan to convert to make a Baal Predator in an old-fashioned style. I have another three complete Rogue Trader Predators, which, despite the benefits of employing Lucius Pattern Predators, I plan to include as part of my Astral Claws force, in line with their "Big Guns" ethos. I have the Assault Cannons from the Ravenwing box to use, as well as several styles of Heavy Bolter. I may magentise to I still have the option of making this a regular classic (Auto-Las) Predator, but it needs stripping before I can start work. Very impressive work Fifty, love the use of the older style models, great colour scheme and really sharp shoulder pad freehand! "I came I saw I conga'd"
Everything looks really great fifty! Love the way your guys are coming out and that terminator really pops! Don't know how you can stand to do the checkerboard pattern... that would drive me nuts. I have one suggestion. I like the way your toops look, but I think they would benefit from some edge highlighting on the upper edges of the armor plates. It will help differentiate the various parts of the armor and make them pop a bit. Great work! Looking forward to seeing more as time goes on. On the Tac squads? I agree it would improve the look, but to be honest I think I want to finish these guys and get onto the next job! My assault squads will be both be undercoated black before painting the base layer to get the depth that way. I am also thinking of using Bleached Bone instead of (???) Grey as the base colour to paint over for my shoulder pads to give a slightly different colour there too. Oddly, I find the painting checker pattern almost therapeutic. I find I concentrate so intensely as I am doing it I forget about the rest of the world. Ahh, vintage, models, always good for a bit of nostalgia! I'm a fan of the checks, they add a nice bit of detail to the marines, which might otherwise look a little plain if they were just all one colour. I'm also inclined to agree with the above suggestion about highlights. I think it's brave that you've gone for a black undercoat for yellow models, as I recall that some gw light colours (especially yellow, red and orange) have poor coverage over the darker ones. Maybe if you want the depth without starting with black, a white spray, then iyanden dark sun or evan the orange foundation paint (I forget the name) might work as a darker base. EDIT: just reread the part where you mentioned using iyanden arleady. Maybe just an orange base over white as an alternative. I've done a test model starting from black, and the Iyanden Darksun gives good enough coverage to work from. I will try to dig out the test model to post as well. The foundation paints really are very good idea indeed. Maybe I will go back and use some Devlan Miracle in the recesses of the Tac Squad. It won't be as dark as I'd like, but it also won't dirty things up as well if it flows where it shouldn't. I will be keepingtabs on this, it seems great! would love to see another Babad war army! Awesome, It's always cool to see another Badab War army on here, I really like the Lamenters, they may possibly be my next army, so I'll be watching this one with interest! By the way, the models are looking very cool. I stripped the incomplete Ultrasmurfs Predator. I've no idea what type of glue it was held together with, but it fell apart in the wash. Fortunately that is a good thing! The round plates and door from the underside of the model also fell off. I don't think I am going to put them back on, as they'll be so incredibly useful for a bunch of Astartes Forward Firebase Bunkers I am building. I'll use some of the same plating I have on the bases of the models above to close up the underside of the model. I decided I didn't want the Imperial Aquila on the front of my Baal Pred, as I'll inevitably be playing some missions and battles based in late-stage Badab War, or even post-Badab war, once the remnants of the Badab armies were fleeing into the Maelstrom, and it would seem odd. I don't much like those plates anyway, as there is no viewing port for the driver... I had an old front piece from a very old Rhino of my own, so I have ued that. That also means I have two Imperial plates, so I'm sure they'll be useful somewhere. I will probably complete a Rogue-Trader era feel to the top of the turret with greenstuff, but I am also considering doing something using bike fairings from the Ravenwing sprue. What do people think might look best? I LOVE the original predators!! Gave my one to my son for his Doom Eagle army. Such a classic model! Love the assault cannon conversion Fifty... nicely done! Cheers Gits. I love this particular model too. It really takes me back to the early 90s! I know the modern version is "better", but this version just has more character, in my opinion. I got a stupidly good deal on a batch of semi-derelict rhinos, predators and a whirlwind a few weeks back. After I did a bit of deconstruction, I landed up with two full classic predators, a complete rhino, and enough of a rhino to combine with bits from my own bits box, PLUS this horrible blue thing which is complete enough to build this Baal Predator. All I am lacking is the exhaust ports for one of the vehicles, but I am confident I can knock something together there. Another comment from me: didn't "see" it in real life, but in the photos, it looks as if the sensor array from the Ravenwing set might be a nice fit in the space between the Cannons... What do people think? Nice to meet you sir. I can relate to your schedule issues and will hopefully draw inspiration from your progress. The old skool Predator looks ace. Oh how dearly I'd love to get my hands on one. Maybe modeling similar turrets from scratch is an option though. When I started, they'd just released the metal versions so the original was a piece of mythological kit for me even then. Your threads were amongst those that first ever attracted me to Dakka, and I've just had a look through some of them again. I hope I do inspire you to paint more! Not much done this weekend. Mostly played around with my Honour Guard. Being Blood Angel derivatives, they are more like the Vanilla Command Squad. I have no intention of acually buying any models specifically for this squad. I've built them out of bits lying around from other purcahses, and I'll be adding lots of purity seals and any other appropriate looking parts. I haven't decided whether to paint them gold yet, as the Blood Angels codex says I should for Lamenters. I am tempted to massively increase the amount of checkering on them instead. What do people think about that? The Chapter Champion has has power blade held up in front of him in a fairly static pose. I realised that the hand that normally supports the missile launcher could do a similar job here. I think it looks quite a nice pose. The Chapter Banner, The Banner of Tears in later versions of the chapter. I think I'll make a Greenstuff banner, rather than paper, so I can paint it properly. I'll also be adding either skulls or at least end pieces to the banner poles and using some bits from the Ravenwing sprue. I am not sure I like the Lightning Claw, as it came from a terminator and the scale looks slightly wrong. I need to do a bit of greenstuffing repair to the arm, then undercoat and then decide if it looks okay. The last guy looks like he is tipping forward in the photos, but isn't really. It is another fairly relaxed pose, and that is true of pretty much the whole squad. The Tac squad are in a very formal pose, then one of the Assault squads will be charging, the other reacting. I won't bother posting photos of a bog-standard Apothecary! i would rather see you go with more checkers! Because you like checkers, or you like how long it takes to paint them? Great stuff mate. I understand the whole teaching+gaming=no time conundrum (though sub 2kids for the football!). This is great blog and really good to see folk who, like myself, are getting back into the game after a long absence. Btw, I have the leftovers of Sanguinary Guard from making Owl Vanguards for Mentors, pm me if you want em. As for yellows and browns with depth, opacity and flow, I cannot recommend GameCraft's paints highly enough; their Khaki and Yellow have great coverage and blend beautifully. Don't suppose you fancy doing tutorial on you checkers? I am off sick today, so I may try to do a checker tutorial, if I can find a base-coated model to do it on. Getting there with the predator. This is my first Green Stuff work for ages, so I was a bit worried, but with a tiny bit of work, I reckon I can get the shape at the bac of the assault cannons as I want it. I didn't smooth it perfectly into the dome, as I figured a bit of a bump would suit the aesthetic of the vehice as a whole and the dome specifically a bit better. As I say, I'll need a little work on the back of the cannons, but I think they'll be okay. I have a little sensor probe from the Ravenwing sprue I am planning to fit between the barrels to deal with the odd-looking void that would be there otherwise. I just like the angle in this photo. As you can see, I haven't drilled the Heavy Bolter barrels yet. On the other bolter, I'll also need to transfer the skull detailing to the other side so it is not left blank. I also need to block out most of the back of the sponson, but I'll need to leave some space to allow rotation of the Heavy Bolter. Liking this a lot; really love the classic parts fused with the new. I love the work on the Old School Pred! You have inspired me to work on my own! Although mine will be Chaos, and I need to fabricate a Twin-Linked LasCannon, but I have subscribed to your thread, and look forward to more updates! Keep up the good work! Nice work with the predator! Interesting project, this won't be my last visit! After the Lamenters' part in the Badab War, their chapter banner was a tattered remnant. 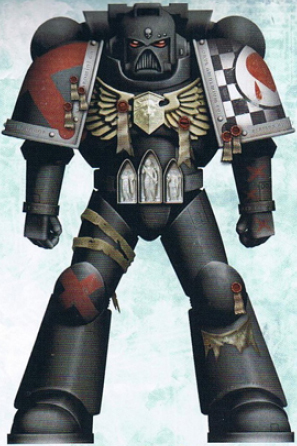 When they were granted the Emperor's forgiveness, the banner was given to the Adepta Sororitas to be repaired and purified. Their handiwork was said to be inspired by the Emperor, and that they wept as they wove, contemplating the Emperor's great sacrifice for humanity. The banner became known as the Banner of Tears and was taken with the Lamenters on their penitent crusade. I'm going to need to make two chapter banners. One for when I am playing as post-Badab War Lamenters, and one for games during it. Based on the fluff above from the original Badab War article, IIRC, I could really use some help from creative types of how the banner should look. Nothing from Google was even remotely useful when I typed in Banner of Tears or Banner of Tears Lamenters. Ideas, and especially actual art, all gratefully received! It's ok, imo. I had some spare time and whipped up a mock banner for you on MS Paint. It's a little shoddy, but the "idea" is def there. If you can get passed the Greatful Dead reference, I think it could work (obviously, you could simply change the skull design so that people don't instantly think Greatful Dead). Having the skull at the center and maybe script litanies vertically down the sides of the design for added fluff. Thanks Moltar. I had been thinking of lots and lots of tears, but I suddenly quite like the idea of either a skull or other face crying. I like the skull having the checker pattern on it. As I'll be free-handing it, I am tempted to try and fade the checkers in from the edge of the skull and do it like this. I am not completely sure if I'll make this the banner of tears, but I certainly think I'll use it. Maybe as the Badab-era Chapter banner, or a Company banner. As for Death Company, I plan to include some. I have inadvertantly acquired about 30 older Death Company models, so I'd be a fool not to! They are quite low down on the priority list though! They'll probably be one of the last things I do to reach 3000 points. Glad you like it! Needless to say, if you didn't I would not take offense. Glad you're planning on using the Death Company, but understand that it's towards the bottom of your to-do list. I look forward to what you'll be cranking out. The pred is actually built and ready for an undercoat. I drilled out the barrels of the sponson Heavy Bolters, then drilled through and fed through some copper wire to make a swivel. I also bought some plasticard this afternoon to seal up the back of the sponsons. I put a nice round plate I found between the Assault Cannons to finish things up there. I've also made a greenstuff banner for the Honour Guard to do some free-handing on, and have a sculpted Blood Angel one from the Sanuinary pack coming from inmygravenimage in the next few days (Cheers Graven!) incase mine looks dreadful! Photos today or tomorrow, hopefully, but I am not sure I want to risk spraying an undercoat whilst it is this cold.